Sealed tenders are invited for procurement of EDM Brass Wire for the CNC Machine (FANUC ROBOT ALPHA liB). This procurement shall be strictly as per specifications noted in Annexure-1. 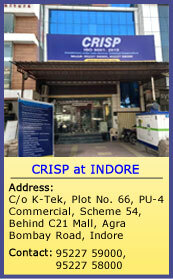 Further details with respect to procurement may be downloaded from our website: www.crispindia.com Tenders complete in all respects shall be received at CRISP counter by 4:00 p.m. on 25th March, 2017.CEO, CRISP reserves the right to cancel any or all bids without giving any reason.